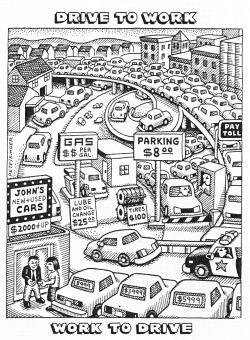 There’s been no shortage of head scratching in the mainstream media over the death of America’s love affair with the automobile. Most coverage attempts to link the sharp decline in motor vehicle use with a faltering economy, or claim there is no single conclusive reason car sales have dipped a staggering 23% over the last decade among 16-34 year olds. Automotive industry executives and analysts like to pretend this is a short term trend, that when the economy ramps back up, Gen-Y will start having babies, move to the suburbs, and drive all over the damn place like it was 1959. Yet this swift decline in car use precluded the economic crash, and even began before gas hit $4.00 a gallon. One out of every five prime time commercials is an ad for a car or SUV, and for good reason: people must be bombarded with advertising to believe in spending ten grand a year on an inefficient machine that spews poisonous exhaust and kills anyone it touches while moving at speeds it was designed for. Yet all this advertising is no longer getting the job done, and the ad execs know it. As much as they’d like to deny the fact, there’s a real cultural shift happening, and it’s occurring in spite of the economy and in spite of the cost of gasoline. People are tired of sitting in gridlock, of breathing polluted air, of the anxiety and frustration induced by road rage, of watching governments doing nothing about global warming. 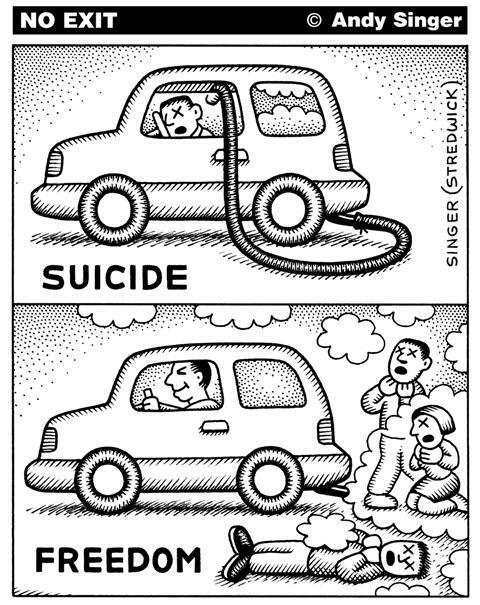 They’re sick of car companies and their marketing lies, of seeing friends and loved ones maimed and killed by two-ton metal boxes racing down streets that were originally designed for people, not cars. And it is the youth that are sickest of all.